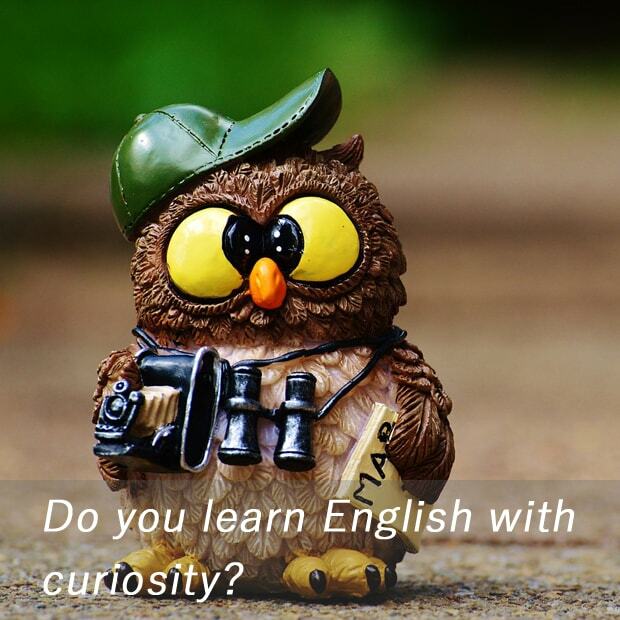 Do you learn English with curiosity? It seems that in Japan, many people are interested in speaking English but most of them don't have deep/further curiosity beyond learning English. Learning English with curiosity is very important in terms of keeping up your motivation and making English language as something fundamental for you. For example, how does your "curiosity level for learning English" affect to the final outcome of your one year English learning? Let's see! People who are forced to study English without curiosity in foreign cultures, people, societies and etc. can't keep their motivation to learn English. As a result, they often end up with no progress in 1 year because they are just studying English with textbooks. OK, I think most of Japanese people are categorized in this group. For exaple, university students have a strong motivation to learn English, because for them it looks like very important to have higher score in English exam such as TOEIC. However, this motivation doesn't last long, often not even a year. Read also why TOEIC score is completely useless. Compared to people who doesn't have real curiosity beyond learning English, for those who want to learn/experience many things out in the world "need to" learn English. Also, they learn English through their curiosities doing something for real, not on the textbooks. That makes a huge difference between two other groups of people I mentioned above. As a result, in one year, they are the only one who create more opportunities to use real English without paying English classes. As I described today, to have curiosity out in the world is very important to learn English more quickly and effectively. If you're currently struggling to learn English and you have no idea why it's so difficult to you, try to find where your curiosity is or try to connect your existing curiosities to the way you learn English. Well, that's all for my today's journal. Thank you always for reading my English diary. See you next time!